Iconic local dishes like Cincinnati chili may not be entirely healthy, but they are incredibly popular. Across the country, K-12 operators are finding ways to add these foods to their lunch menus while still meeting their nutritional requirements. How are they adapting popular recipes and bringing them to schools—and is it worth it? Cincinnati chili has been a staple of Mason City Schools lunches for as long as anyone can remember. 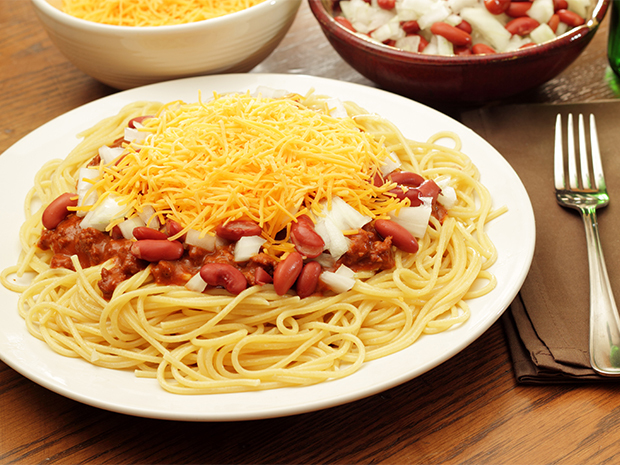 Located just outside of Cincinnati, the school system serves its chili in two traditional ways: covering a pile of spaghetti, or atop a cheese Coney dog. “It has survived the test of time,” says Tamara Earl, child nutrition supervisor. Cincinnati chili days are huge for participation: Mason High School served 1,029 cheese Coneys on one day in October—and only 548 grilled cheese sandwiches on another day that week. “Where there’s a will, there’s a way,” Earl says. In chili parlors across the state, Cincinnati chili is an indulgent dish generally served with towering mounds of cheese. It’s a huge challenge to adapt a dish like that for a healthier menu, but Earl says it’s worthwhile. Mason City uses a premade reduced-sodium sauce, reduced-fat shredded cheese and whole-grain spaghetti. Because of lower sodium and calorie limits, younger students get turkey dogs instead of the pork and beef dogs served at the high school. Across the state, Columbus City Schools are taking a new approach to representing local dishes. Through a new monthly Ohio Days: My State, My Plate program, these schools are highlighting fresh ingredients like Ohio-grown apples and locally raised turkey. The goal is to eventually make menus as minimally processed as possible.